Venny Etienne is an accountant by day, a designer by night, and a newly minted Bravo reality star. For Venny Etienne, the sky is the limit, after riding Cardi B’s python-skin coattails (the rapper wore one of his trenches at a high-profile after-party) straight to this season of Project Runway. That Cardi B moment became Etienne’s calling card, bringing attention to his emerging sportswear brand, Levenity, and creating more demand for the $4,450 coat (python doesn’t come cheap after all). He also believes it helped bag his biggest break: a spot on Project Runway’s 17th season, which returned to Bravo on March 14. 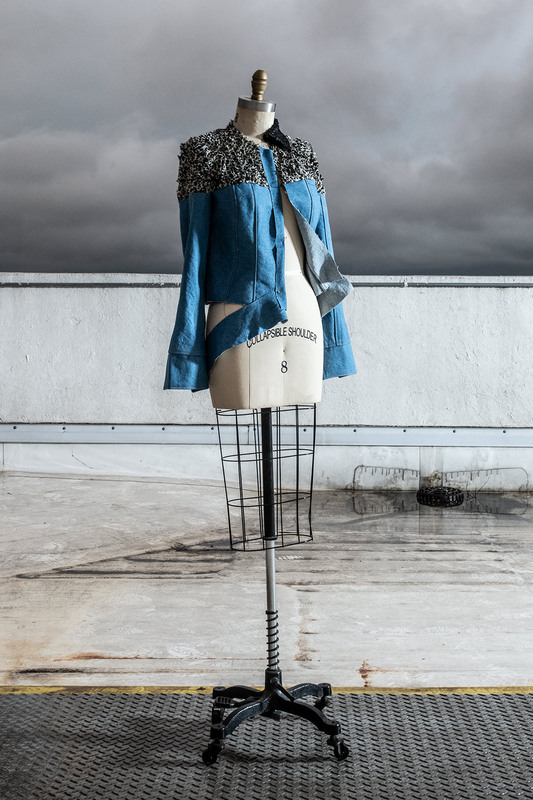 When we caught up with him at his studio in The Cedars, the designer was working on this jacket for the annual DIFFA/Dallas fundraiser. But Etienne credits his success to the relationships he built after moving to Dallas on a whim seven years ago, with little more than a suitcase and a sewing machine. The direct line from Big D to Cardi? That would be Dallas-based celebrity stylist J. Bolin, who has worked with the likes of Dwight Howard, Michelle Williams, and Vivica A. Fox, and mentored the man responsible for the rapper’s red carpet-stopping get-ups. Before Bolin, it was local stylist Willie Johnson who took Etienne under his wing, pushing him to start his first fashion collection, telling him what shows he needed to participate in and what parties to attend. “I just went to every single fashion event,” Etienne says of his early days in Dallas. Still, Etienne’s chosen path was not one of those his parents hoped he’d take, which were “doctor, lawyer, or the president, or whatever.” After a stab at studying investment banking (“because I heard those guys make good money”), Etienne was a 20-year-old in crisis. “I called a friend of mine and I was like, ‘I don’t know what I’m doing,’ ” Etienne recalls. “I was having a breakdown. And he was like, ‘Well, what do you want to do?’ ” Etienne thought about the fashion show fundraisers at church he helped style. Crowds of 400 would gather for the events. Through classes at New York’s Fashion Institute of Technology and Dallas’ Wade College, where he got a merchandising and design degree, that ’90s Brooklyn sensibility never left Etienne. The influence is evident in Levenity’s texture-block jackets, long-sleeve crop tops, and layered looks. The python trench made famous by rapper Cardi B. We don’t know yet if Project Runway’s judges appreciated Etienne’s aesthetic. He’s contractually bound by Bravo to keep quiet on how the competition played out. All he can reveal for now is that he’s back in Dallas, working in a bank’s accounting department by day and designing Levenity’s next collection by night.